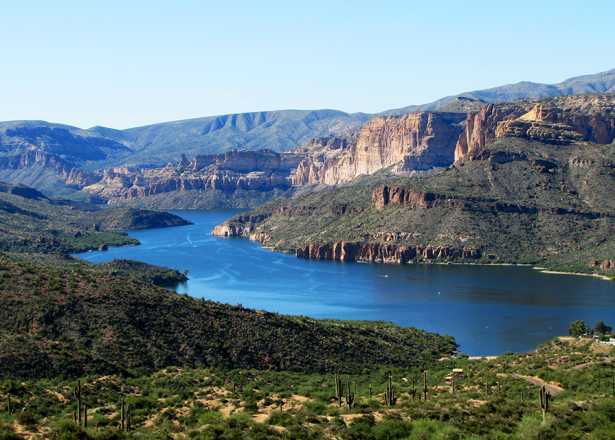 Put on your hiking shoes and get ready for a beautiful display of color from the desert this spring. Here are the best places in Phoenix to see the desert wildflowers. For more up-to-date information about wildflower blooms around Phoenix visit the Desert Botanical Garden&apos;s Wildflower Tracking site, which is active in March and April. Areas in the preserve with wildflower displays usually include the Bajada (M), Las Lomitas (E), Ranger Kiwanic (M) accessible from the Central Avenue entrance. The roadway leading to the Gila Valley overlook (Central Avenue entrance) also offers wildflower growth. Also, look for wildflowers on the north facing slopes in the Pima Canyon and Beverly Canyon (Javalina Trail- M/D) entrances of the park. Gateway Trailhead offers access to wildflower sightings on Horseshoe Loop and Gateway Trail Loop. Poppies are also plentiful along Lost Dog Wash trail in the preserve’s southern section. Trek the Taliesin Overlook off of the main trail for blooms and a scenic view. Find yellow brittlebush, red-orange globemallow, marigold and more along Apache Wash Trailhead. Also check the north-facing slopes on trails from the Desert Vista Trail parking area, including areas along the Desert Tortoise and Verde trails, both accessible from the trailhead parking area. Several trails with north-facing slopes around Piestewa Peak accessible from the Phoenix Mountains Preserve are good spots for wildflower viewing. In Dreamy Draw Recreation Area, hillsides and washes surrounding Trail 100 often are covered in a wide variety of wildflower blooms. Piestewa Peak, Quartz Ridge Trail #8A (M): Trailhead located at northeast corner of 32nd Street and Lincoln Drive. In this park on Phoenix’s east side, you’ll find an easy stroll with a pretty payoff on Merkle Trail (E). The Pass Mountain (D) loop hike is a more strenuous option for hikers to take in over seven miles of scenery and spring blooms. 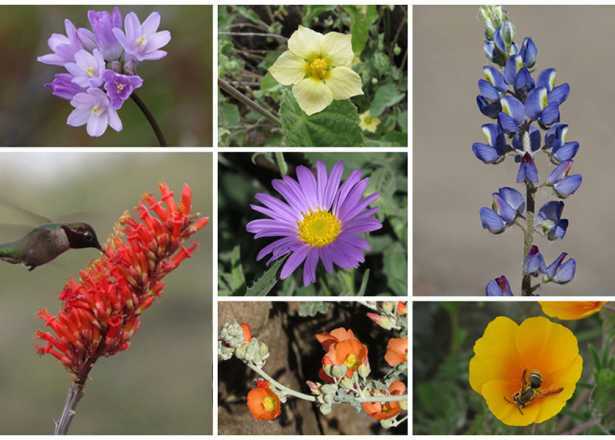 You can’t go wrong on a wildflower hunt in Spur Cross Ranch Conservation Area, which boasts a huge diversity of blooms. Look in particular along the western end of the Spur Cross Trail (M) and, if you are up for a challenge, the southern part of the Elephant Mountain (D) loop. Read our feature on Spur Cross Ranch’s wildflower expert, ranger Kevin Smith, part of our PHX Stories series. Thousands of blooms surround the path and mountainsides around Rainbow Valley Trail (M/D), a 4.2-mile hike. Access the trailhead from the west end of the main parking lot. 400 species of wildflowers grow in this tiny county park, and ranger Kevin Smith knows (almost) all of them. These intra-city road trips allow you to travel from Point A to Point Beautiful…and be back home in time for dinner.